Let's go to the hop! 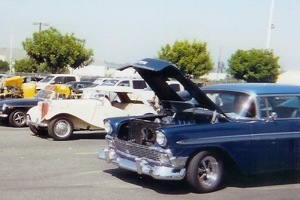 Let Top Notch Events take you back to the 50's. Enjoy a barbecued chicken sandwich at the Happy Days Diner and sip some cherry coke before the hula hoop competition begins. Every detail of your 50's theme has been carefully coordinated from the color of the linens and umbrellas or canopies to the flowers, props and staff uniforms. Themed prizes are even given away. 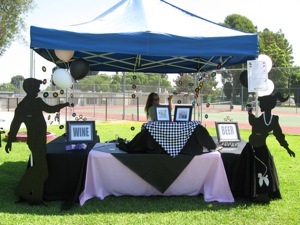 Complement your 50's theme with an Elvis impersonator or a photo board and don't forget to wear your bobby socks! 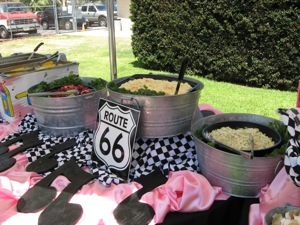 Call one of our friendly Event Planners today and start planning your next themed company picnic or corporate event. We welcome the opportunity to customize an event package to fit your exact needs and budget. "We usually plan the company picnic for every other year. Everyone had so much fun that they are asking if we can have another one next year."